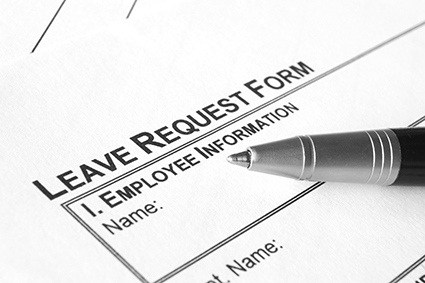 Employee Leave 101: What Types of Leave Are Available? Besides vacation and sick days, what other types of paid or unpaid leave do you offer to your employees? There are many types of leave; some are legally mandated to be available, and others are voluntarily offered by employers. Let’s take a look at some of the various leave options out there. From a legal standpoint, there are only a few types of leave that companies must provide—and even then, most of these apply only to employers that qualify. FMLA leave. The first type of leave that comes to mind for everyone is typically under the Family and Medical Leave Act (FMLA). The FMLA applies to employers with over 50 employees. It provides up to 12 weeks of leave annually for a serious illness of an employee or an employee’s immediate family member, or for an employee to assist an immediate family member for qualifying exigencies related to military service. Note: The FMLA also separately provides up to 26 weeks of leave to care for an injured military service member (i.e., injured in combat). Military leave. The Uniformed Services Employment and Reemployment Rights Act (USERRA) mandates that employers allow an employee who is a uniformed servicemember to return to their job after they return from military service or training. ADA leave. While the ADA does not specifically mandate any particular leave amount, it should be noted that a short-term leave of absence can easily be considered a reasonable accommodation for some disabilities, so employers should not discount this as a possibility. Jury duty. The law actually prohibits taking action against an employee for serving on a federal jury, but it has been interpreted to mean that employers must allow employees to serve on any jury without negative consequence—thus, meaning businesses, in effect, must allow leave for such a purpose. At the federal level, there is no requirement to pay nonexempt employees while they’re on jury duty, but be sure to check various state and local laws. Workers’ compensation leave. Workers’ compensation leave must be granted after an employee injury. Religious observance. Title VII of the Civil Rights Act protects employees from religious discrimination, which, in effect, means that employers must allow employees to take leave for purposes of religious observation if requested as a religious accommodation. It’s important to note that vacation and sick days are not actually legally required at the federal level. It’s also important to note that many state and local laws provide many more benefits for employees in terms of legally mandated leave. Be sure to check your local laws on this issue, as this article only discusses the federal leave laws. This list is not meant to be fully comprehensive of every conceivable type of leave, but instead, it’s meant to cover the primary leave types offered. How does the list compare to what your organization offers? *These items in particular frequently have legal requirements at the local level.